Panton Flowerpot is one of Verner Panton’s simplest lamps, and became a huge success for him. The principle behind Panton Flowerpot rests on a very simple geometric solution, where the top part is a hemisphere, and the bulb is screened by yet another smaller hemisphere. 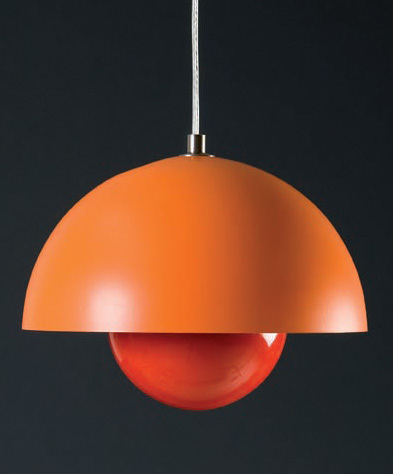 While the large shade is white on the inside, the smaller of the two is lacquered in orange to make the light diffuse. Verner Panton was a close friend of lighting designer Poul Henningsen, who intermediated contact between Panton and Louis Poulsen, who in turn set a large proportion of Panton’s lamps in production. Panton Flowerpotwas inexpensive to produce and was purchased by the general public who appreciated the vibrant colours of the 1970s. Verner Panton had great affection for this lamp and thought out formations where many small Panton Flowerpot lamps were hung in groups, so they made up one large lamp. Panton Flowerpot was also produced in a large version with a psychedelic pattern and as a table model, and – more rarely – as a garden model for outdoor use on a long metal pipe. Originally Panton Flowerpot was produced in eight bright colours. Production today has been resumed by Unique Interieur.